In Wisconsin, we absolutely know how to fry fish. Fridays, in almost every restaurant throughout the state, some sort of fish fry is offered – usually cod/haddock, lake perch, walleye and bluegill. In Southeast Wisconsin (maybe not in the rest of the state), we have plenty of authentic Mexican places as well as taco trucks making it pretty easy to get a good version any kind of taco you like. 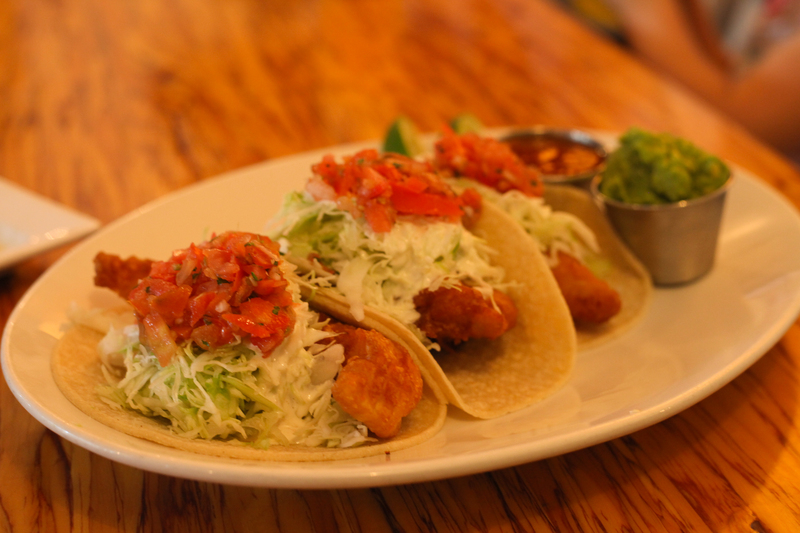 Fish tacos should be a slam dunk, right? We asked our members on our Facebook page to tell us where we could go to find the best fish tacos in SE Wisconsin. We didn’t get as many suggestions as normal, which maybe should have been a red flag. Fish tacos were born in Baja California (that long, skinny strip of Mexican land below San Diego) The classic ingredients are as follows: A lightly fried piece or pieces of firm fish, shredded cabbage, corn tortilla, some sort of thin mayo or crema based sauce, salsa, and a lime for flavor. Sunset Magazine has a great article on history of the fish taco. 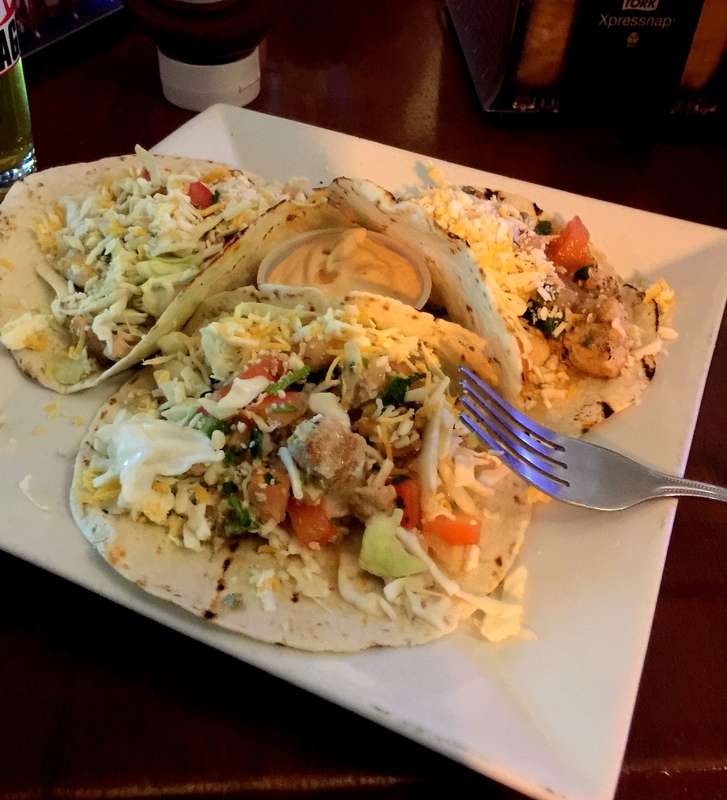 Fish 101, an Southern California restaurant renowned for their fish tacos, sent us the photo below, which shows how a traditional Baja fish taco is supposed to look, with crema on top. In Southern California fish tacos are everywhere, and most places stick to the original recipe. Unfortunately, something has gone awry in Wisconsin’s import of this west coast staple. We went to three suggested places and not one of the places served traditional Baja fish tacos. El Fuego, 909 W Layton Avenue, Milwaukee. 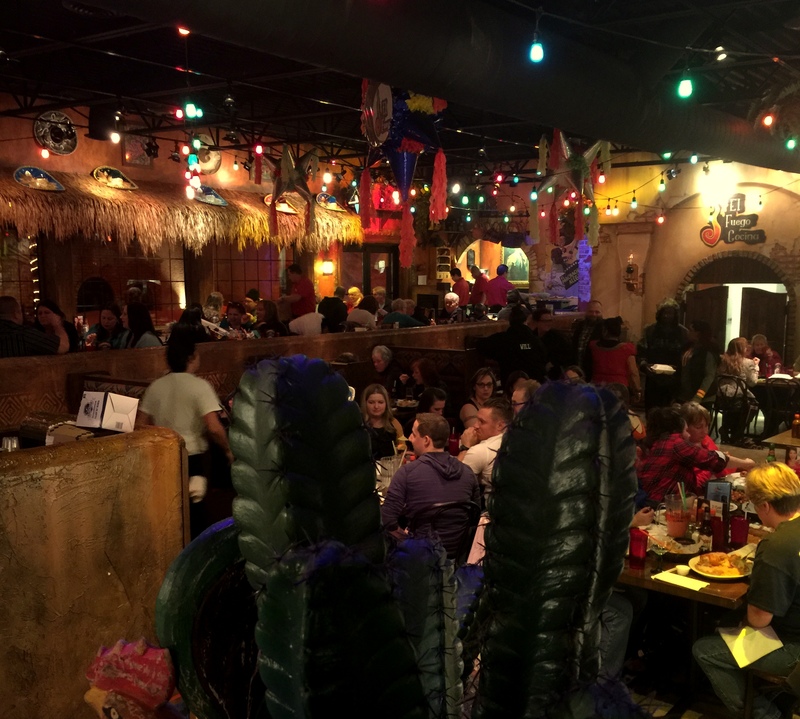 This south side Milwaukee Mexican restaurant is a festive place that came with a waiting list at 8:00 pm on a Saturday night. 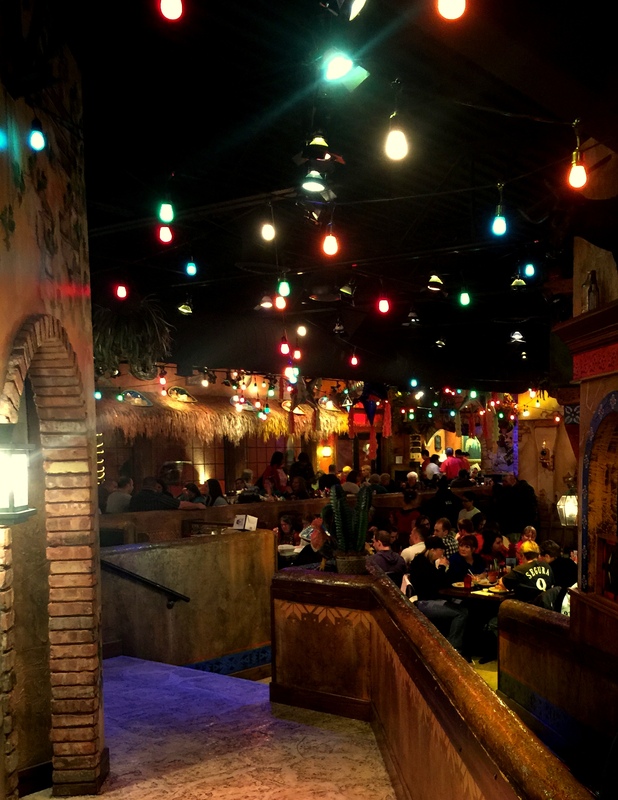 Not a place for a romantic, quiet dinner, but what a great place to come with a group of friends to throw back a few margaritas, get some sizzling fajitas and have a great time. 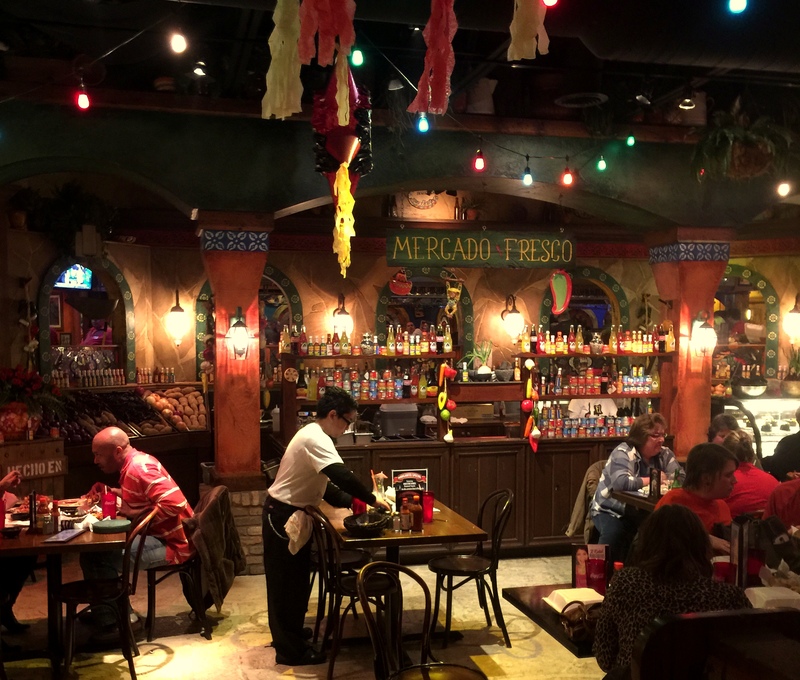 This large restaurant was percolating with loud laughter, pitchers of margaritas, friendly wait staff and families celebrating birthdays. The interior is authentically outfitted with a separated bar area and two huge dining rooms. In warmer months, El Fuego opens up a courtyard for outdoor seating. Because the courtyard is basically enclosed, it is easy to pretend that you are in Puerto Vallarta rather than the south side of Milwaukee. Soft doubled-up corn tortillas (flour was an option as well) held the contents which also included a generous avocado slice. No crema or spice sauce unfortunately. Prices at El Fuego are definitely steeper than most other authentic Mexican restaurants (Fish taco dinner was $16.95). The way I look at it, you are paying for the nice atmosphere; its worth it for a special night out with friends. 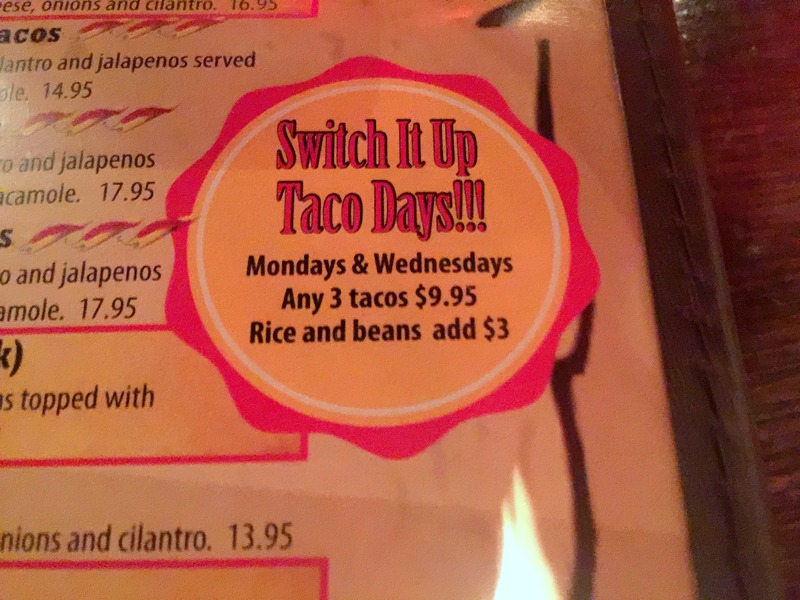 If you want to save a few bucks, go on Monday or Wednesday for the three tacos for $9.95 special. 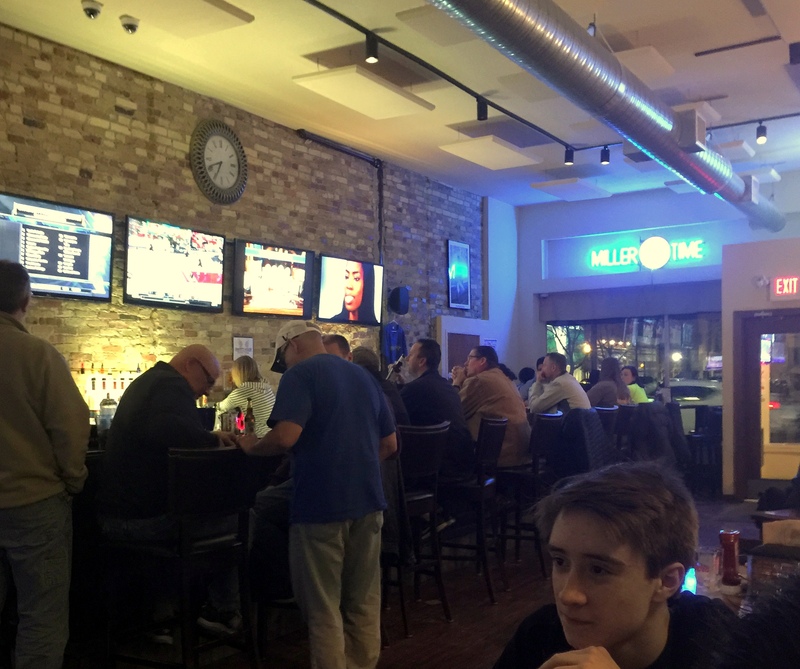 The other two places we checked out were Sazzy B’s in Kenosha and Dewey’s Restaurant and Sports Bar in Racine. Nice places for sure, but we can’t recommend the fish tacos. Sazzy B’s , 5623 6th Avenue is a classy Kenosha restaurant that makes great dessert martinis (they were the winner of our best dessert martini a few months ago) and serves some good food too. The tacos are overpriced. For $15, the entree comes with two tacos and a small scoop of rice. Swai is a pleasant enough fish, but doesn’t justify this price. (El Fuego for $16.95 came with three tacos and a large rice and beans) Fish tacos started as kind of a street food or beach vendor food, and the higher prices seem at odd with their heritage. 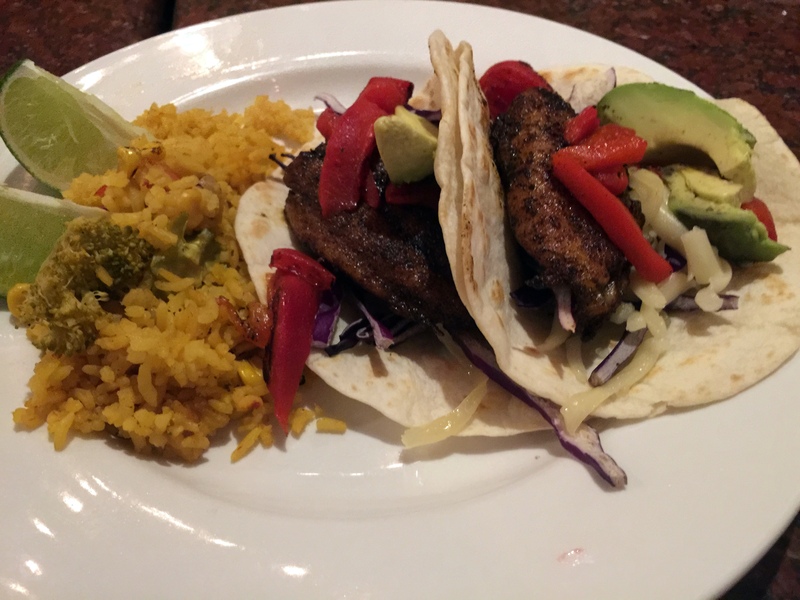 The fish in the tacos was blackened and overall had a good flavor. But when I want fish tacos, I want a fried chunk of fish; I wish Sazzy B’s offered a fried option. The other parts of the taco likewise strayed too far from the traditional fish taco. The tortillas were flour and not adequately warmed up. The red cabbage was thick and chunky rather than thinly shredded. The roasted red peppers were tasty, but also a little odd in a fish taco. Where Sazzy B’s really went too far from the traditional fish taco was by the inclusion of shredded Monterey Jack (I believe) cheese. Many of the bites of the taco you got a bunch of blackened fish and a mouthful of cheese, and it wasn’t a good combo. Fish tacos almost seem a little out of place on Sazzy B’s menu. 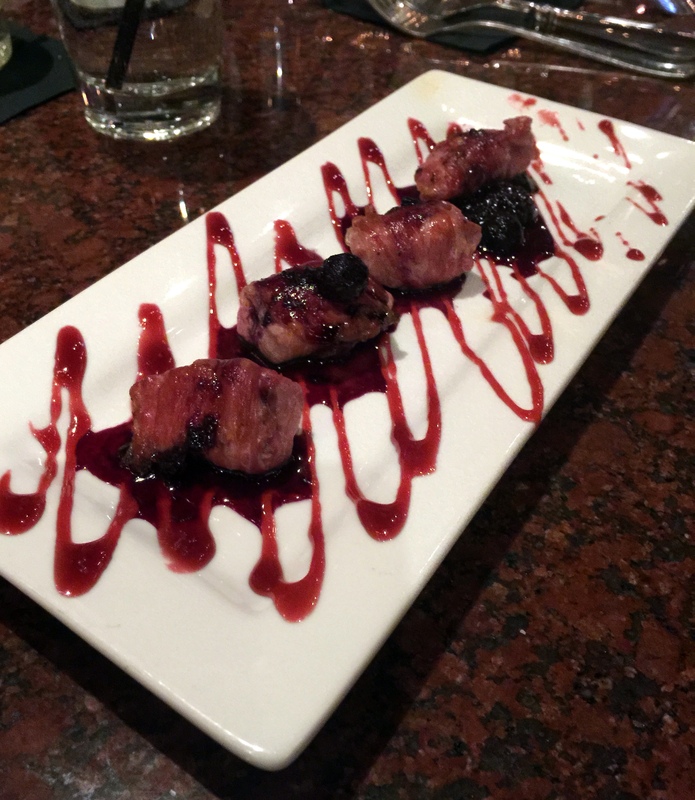 I can’t finish the discussion on Sazzy B’s without complimenting their Prosciutto Wrapped Duck which we also tried. What a perfectly cooked, unique and delicious appetizer (pictured below). Worth a trip to Sazzy B’s for the duck and martinis alone. The mahi mahi was not grilled or fried, but almost like a chunky fish ceviche and had a metallic taste. The main issue was the chunks of unbattered, metallic-tasting fish. I will add that we also ordered some boneless “inferno” wings. When the wings arrived, they were nowhere near “inferno” level, and it looked like a few pieces of popcorn chicken in sauce rather than wings. We actually let our waitress know this, and there was no attempt to correct the problem. It is unfortunate, because the interior is a wonderful setting to watch sports. I wish the food measured up to the setting. In researching and studying menus for this “Take Three”, we noticed that many Wisconsin restaurants unfortunately top fish tacos with cheese. As great as cheese is, we don’t have to use cheese in every recipe, Wisconsin. Also as a footnote, we were unable to go to Ivanhoe which was recommended by many members because there was a special event that night. 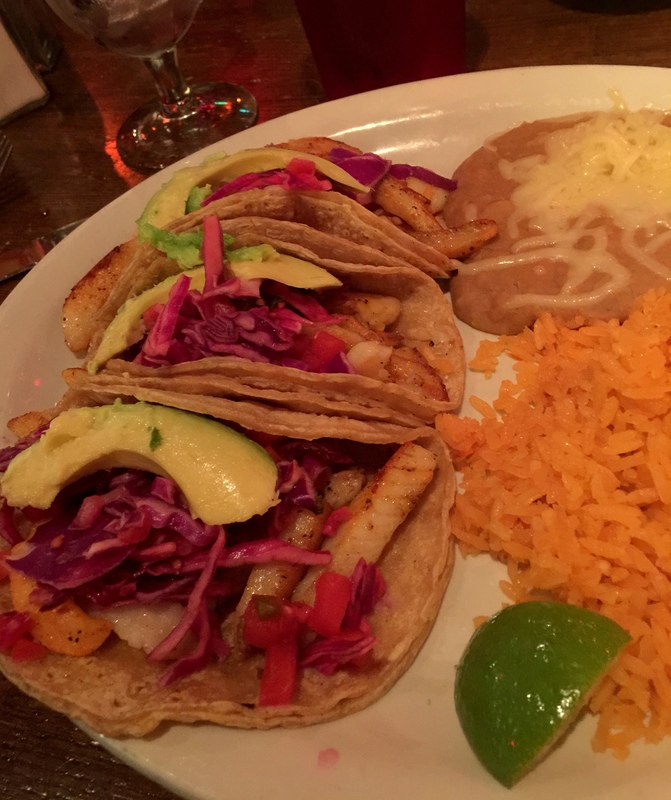 The search continues for a decent authentic baja fish taco in Wisconsin…..